The only solution to our present health crisis is food enzymes. The study of food enzymes in nutrition and human health has been a ‘sore eye’ to both scientists and nutritionists alike. Much study was done in the early years but for some reason was not brought to light. Only now we see some glimpses of the need of food enzymes for maintaining and regaining our health. We will attempt to bring out the importance of enzymes as enzymes are the life force of our body. Without the life energy of enzymes we would be nothing more than a pile of lifeless chemical substances—protein, minerals, vitamins and water. In maintaining health, enzymes and only enzymes do the actual work. They are what we call in metabolism, the body’s labor force. What Are ENZYMES…? Enzymes are the key to radiance, longevity, and youth. According to Dr. Edward Howell, the grandfather of enzyme therapy, an enzyme is “…a protein molecule with electricity running through it…”. Each one of us is given a limited supply of bodily enzyme energy at birth. This supply, like the energy supply in our new battery, has to last a lifetime. The faster we use up our enzyme supply– the shorter our life. A great deal of our enzyme energy is wasted haphazardly throughout life. The habit of cooking our food (several degrees of heat above our body temperature destroys enzymes) and eating it processed with chemicals; and the use of alcohol, drugs, medicines, vaccinations and junk food all draw out tremendous quantities of enzymes from our limited supply. Frequent colds, fevers and exposure to extreme temperatures also deplete the supply. Even thinking requires enzyme activity. A body in such a weakened, enzyme-deficient state is a prime target for cancer, obesity, heart disease and practically all other degenerative problems. Such abuse often ends up in the tragedy of suffering and death at middle age. Today, even young children suffer from a lack of enzymes as we see many with childhood diseases. People can live healthier and longer by guarding against loss of this precious life force (energy) as shown by wild animals in nature, who statistically outlive people and die of only a handful of natural causes. Bodily enzyme depletion and aging go hand in hand in both laboratory animals and humans. There is a crippled attempt of modern medicine to heal disease and its failure to attack the root of the problem. So what can we do? One fatal process that may be the cause of all humanity’s bodily ills is the cooking of food. Prolonged heat destroys 100% of enzymes in food. We must replendesh those enzymes by adding more raw foods into our diet and unless grown on fertile soil, raw foods can also be low in enzymes. Especially the imported foods that are raised on depleted soils, harvested unripened and transported over long distances. 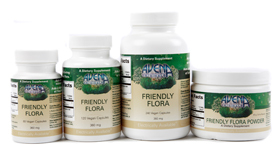 Supplementation of plant enzymes is then essential for us to maintain and regain our health. Larger quantities of enzyme supplementation has also been proven to help eradicate many health challenges such as cancer, arthritis, obesity, colitis and many other illnesses. When supplementing, care has to be taken that enzyme supplements must be plant based, of the highest quality, contain no fillers and must not be destroyed by the high acid of the stomach in order to be effective. Minerals are required before vitamins can be effective … and before minerals are utilized we need utilizable protein and for protein to be effective we need enzymes! The Heat of cooking DESTROYS ALL enzymes! Enzymes and Friendly Flora… the patented probiotic, ‘IS’ our immune system. Enzymes and Friendly Flora have been used to eliminate death-bed cancer… Read the “miraculous” story in our forthcoming blog soon!